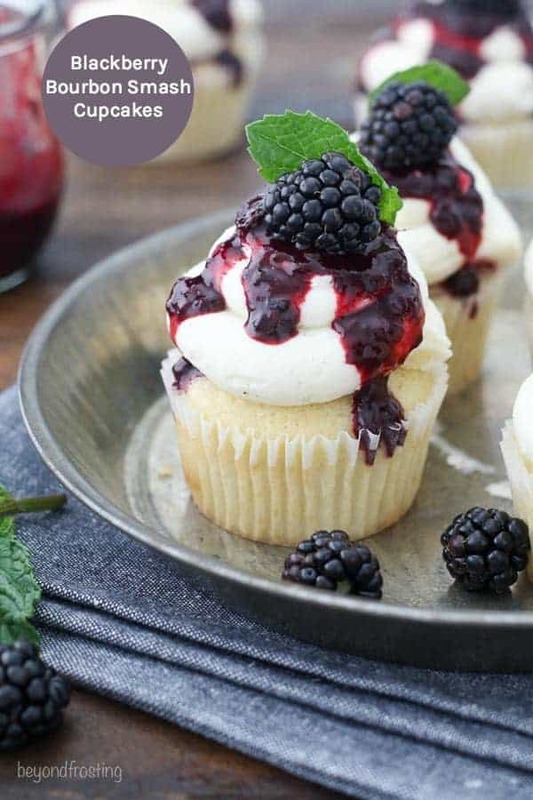 These Blackberry Bourbon Smash Cupcakes are vanilla bourbon cupcakes with a blackberry mint infused filling and topped with a vanilla bean buttercream. While there is never a bad time for a cocktail, something about summer time and cocktails just makes me smile. You know what else makes me smile? 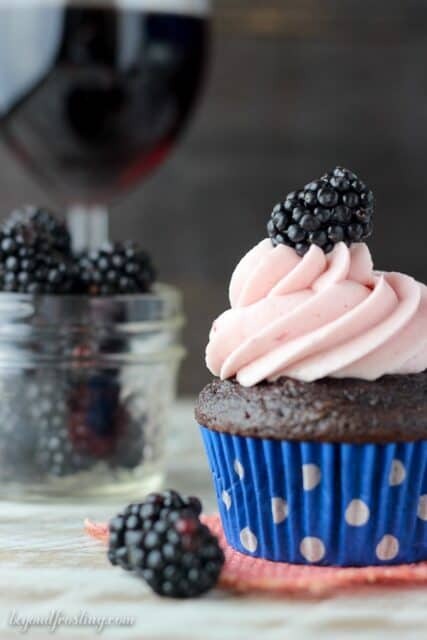 Cupcakes, especially if they are boozy cupcakes! I mean seriously. 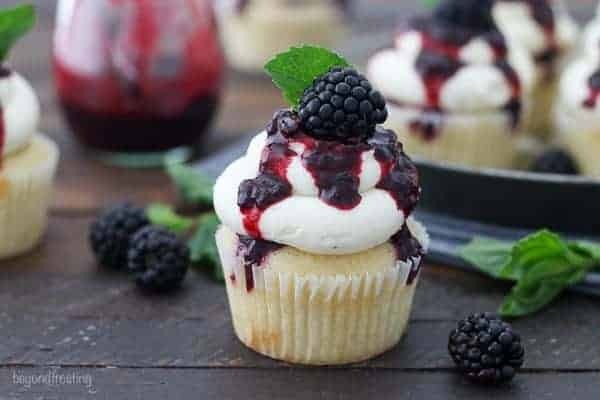 These Blackberry Bourbon Smash Cupcakes are vanilla bourbon cupcakes with a blackberry mint infused filling and topped with a vanilla bean buttercream. Each fabulous component is completed with a touch of bourbon. If you’re not familiar with a bourbon smash, it’s a cocktail recipe made with simply syrup, fresh muddled mint leaves, lemon and bourbon. The blackberry Bourbon Smash is obviously made with the addition of blackberries and sometimes finished ginger beer or seltzer. 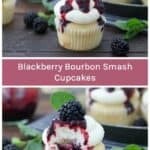 I’ve wanted to make a bourbon blackberry cupcake, for a long time, but I just wasn’t sure how I wanted to do it. Finally, this idea popped into my head when I was researching cocktail recipes last weekend. 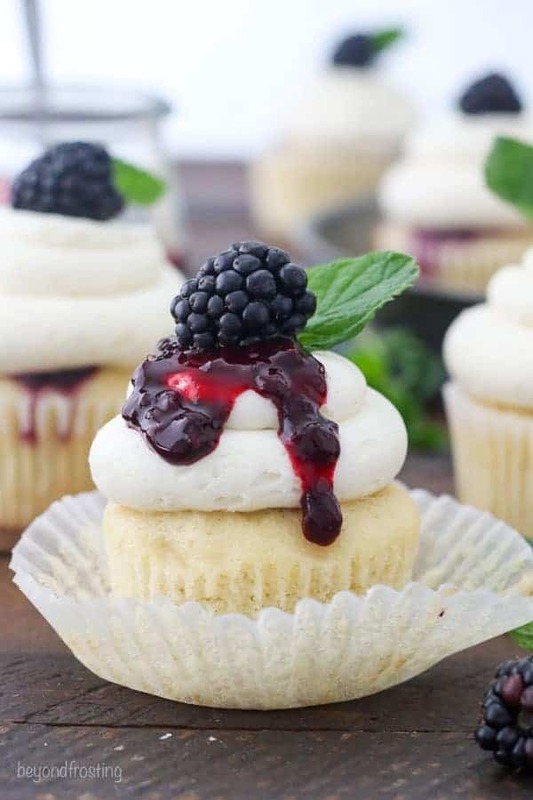 The bourbon vanilla cupcakes are a variation of my moist vanilla cupcakes. By making a simple swap of bourbon in place of half of the milk, we got ourselves a beautiful whiskey infused cupcake with the aroma to back it up. The cupcake is perfectly moist, in part due to the sour cream in the recipe. It’s a bit denser as opposed to light and airy. Also, the batter is relatively thin, so it’s helpful if you use a measuring cup or a large cookie scoop to help fill your cupcake pan. 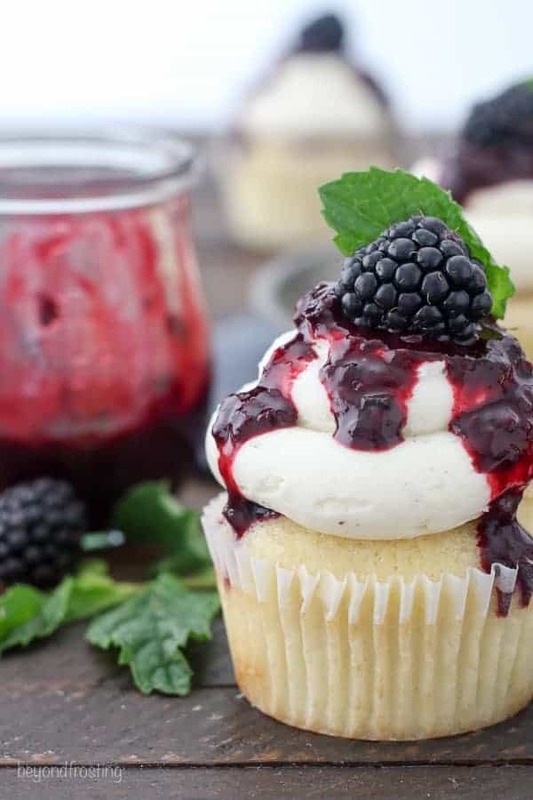 At first you might think the cupcake is too strong, but once you add the filling and the frosting, everything balances out and the flavors blend together so nicely. The blackberry filling is quite simple. It’s made on the stovetop and the idea is to partially cook down the berries into a chunky sauce. You want to leave some berries whole so that it creates a nice texture in the filling. 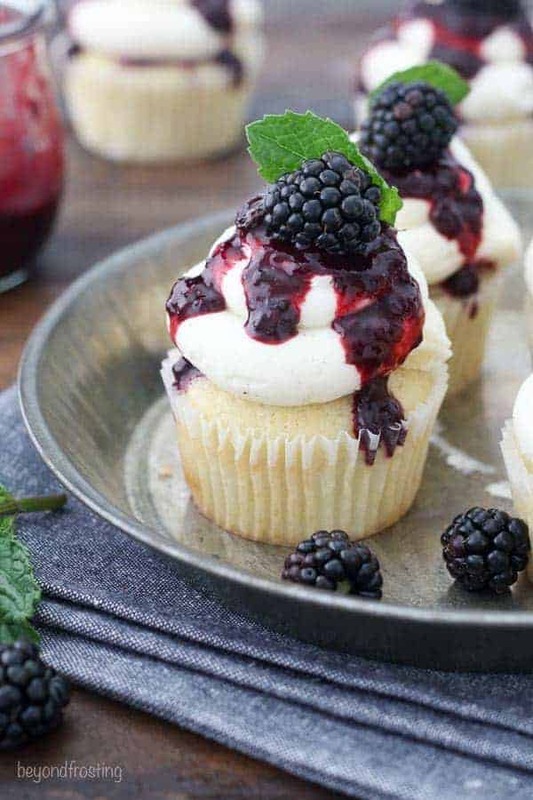 The blackberries are coated in sugar and flour and cooked down with fresh mint leaves, bourbon and lemon juice. The sauce will thicken as the berries breakdown, but it thickens even more as it cools. The recipe for the sauce makes more than enough for filling the cupcakes, so I took the extra sauce and drizzled it on top of the frosting. I love it because I can never get enough of the filling inside the cupcake. One word of advice on the topping, you want to add it right before serving, or the day of. Once it sits overnight, that intense purple color starts to give your frosting that tie dye look. To fill my cupcakes, I like to use my favorite cupcake corer tool, but if you don’t have anything like that, simply take a knife and cut out the center of your cupcake. Just be sure not to cut all the way down to the bottom, because you need that bottom layer to support your filling. For the frosting, I made my favorite whipped vanilla frosting. It light and airy, almost like whipped cream! My recipe calls for cold butter, which is whipped in the beginning and in the end to incorporate lots of air into the frosting. To frost these cupcakes, I used a large open round tip. 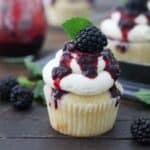 In addition to the blackberry filling, I garnished them with a fresh blackberry and a mint leaf. Aren’t they pretty? These cupcakes are for adults only! 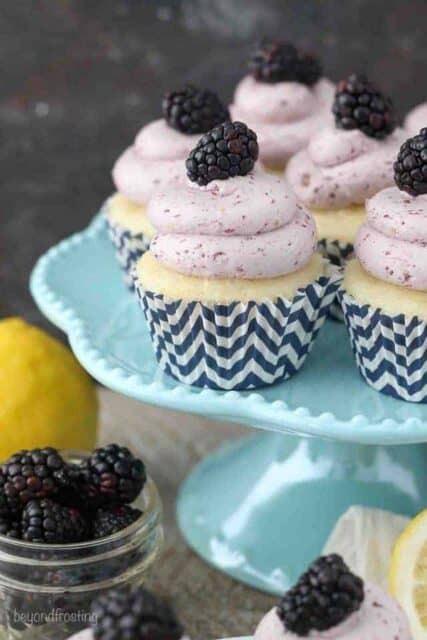 However, if you’d like to make these cupcakes alcohol-free, you can use all milk in the cupcake recipe, omit the bourbon from the blackberry filling and the frosting as well. But sometimes, we adults need a treat especially for us. Am I right? For the cupcake: Preheat the oven to 350°F. Line a cupcake pan with cupcake liners. Add half the flour followed by the baking powder and salt, and beat on low speed while pouring in the bourbon and mix just until the flour starts to incorporate. Finally add the remaining flour, mixing on low speed while pouring in the milk and beating until all of the ingredients are well combined. For the filling: In a medium-sized sauce pan, combine the blackberries with the sugar and flour stir well. Then add the lemon juice and bourbon. Cook over medium-high heat until mixture starts to breakdown, boil and bubble, stirring frequently. Reduce heat and simmer for another 5 minutes, stirring occasionally until the blackberry sauce starts to thicken. Remove from heat and allow the sauce to cool completely, refrigerating to help speed up the process. Sauce will thicken more as it cools. Once the filling has cooled, cut out the center of the cupcake using a knife or a cupcake corer. 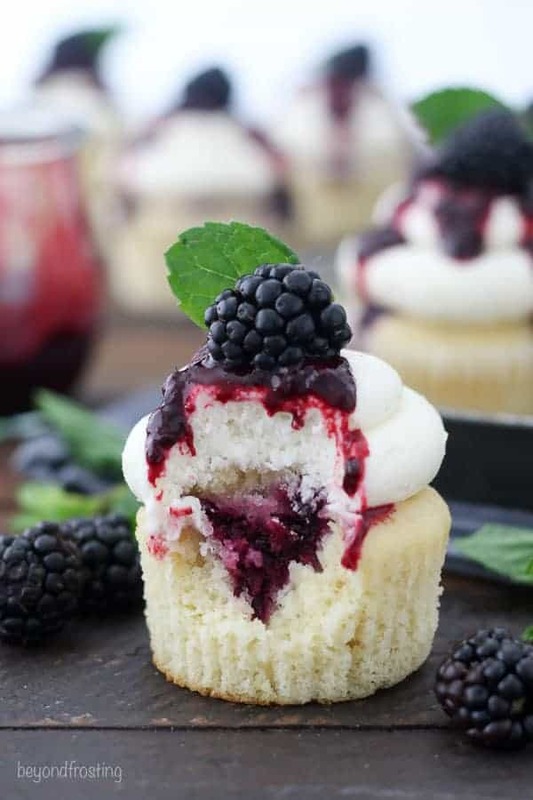 Fill the center of the cupcake with blackberry sauce. Set the leftovers aside. For the frosting: Cut the butter into pieces, about 1 tablespoon size. Using the paddle attachment, whip the butter for 3-4 minutes, scraping down the bowl occasionally. Beat the butter until it looks lighter in color. Alternate slowly adding the powdered sugar, 1 cup at a time, with the liquid ingredients, mixing on low speed until it’s incorporated into the butter. Then increase the speed to high and beat for 30-60 seconds. Repeat until all your powdered sugar and liquid ingredients have been added. 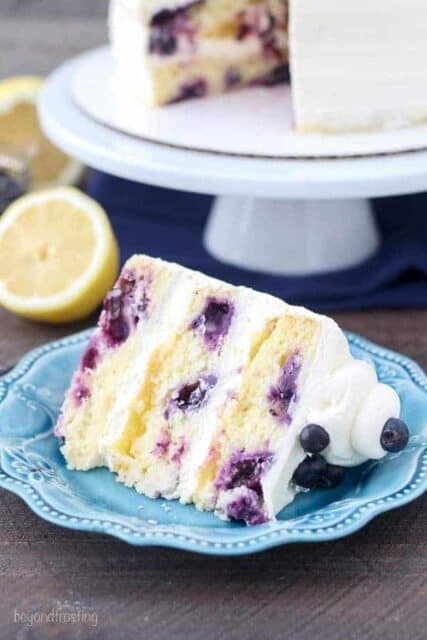 Once all the ingredients have been added, beat at a high speed for about 2-3 minutes until the frosting is light and fluffy. In a large piping bag fitted with a large open round tip, pipe the frosting onto the cupcakes. Garnish with leftover blackberry sauce before serving, top with a fresh blueberry and a mint leaf. Keep these in an airtight container. Love a boozy dessert! You’re so right that summer and cocktails just go together. You read my mind because I had not heard of a bourbon smash, but have clearly been missing out. Can’t wait to try these!